Dear Heavenly Father, Oh, how the plan to send your son to earth burned in your heart until it was done. As you waited to right our wrongs and give us peace in our consciences you proudly prophesied of that day. You chose a small town and an insignificant place to give your Son flesh and bone. You demonstrated that you came for all people whether great or small, whether ancient or modern. You are no respecter of good or bad. You came to redeem us all. Now I ask, by the spirit of your Son, Shepherd my heart and life and give me peace to calm me every day. Help all your people to live in that peace and so reflect the salvation you have to their families and friends. 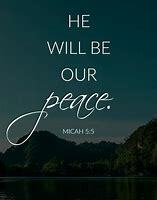 Be our peace and help us to multiply peace in our peers. Amen. Jesus comes to the small places and small people to give them big peace.